Edamame is a green vegetable more commonly known as a soybean, harvested at the peak of ripening right before it reaches the “hardening” time. The word Edamame means “Beans on Branches,” and it grows in clusters on bushy branches. To retain the freshness and its natural flavor, it is parboiled and quick-frozen. In East Asia, the soybean has been used for over two thousand years as a major source of protein. Edamame is consumed as a snack, a vegetable dish, used in soups or processed into sweets. As a snack, the pods are lightly boiled in salted water, and then the seeds are squeezed directly from the pods into the mouth with the fingers. 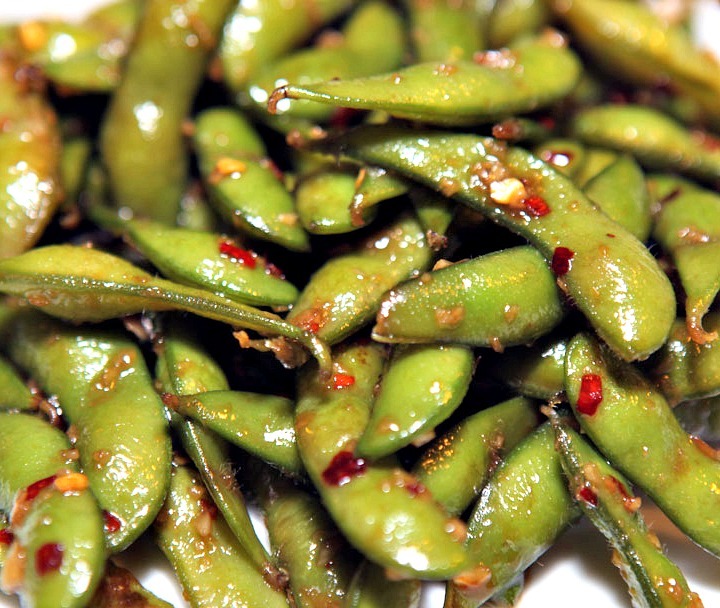 The flavor of edamame blends well with garlic, chili and soy sauce. My mouth is watering just thinking of the combination. Today, I boiled up two pounds (doubled the recipe) and plan to snack on some yummy, flavored edamame all week. Boil edamame in lightly salted water until until tender (about 5 minutes) and drain. Heat olive oil, red pepper flakes and garlic cloves in a skillet over medium heat (1-2 minutes). Stir in edamame, sprinkle with lime juice and salt.